It’s hard to pinpoint exactly when it happened, but somewhere in the 2000’s or perhaps 2010’s there was a collective cultural reawakening and renewed appreciation for the actor Nicolas Cage. Perhaps it was due to the broadening of meme culture and prevalence of GIFs as a viable communication tool. Perhaps it’s entirely due to the infamy of Neil LaBute‘s unnecessary remake of The Wickerman which is often cited as being one of the best (worst?) of the so-bad-it’s-great horror collection. Or maybe it had something to do with fan-made “greatest hits” video mashups of the thespian’s most outlandish moments. Whatever the reason, the Chuck Norris of the internet age had gone from acclaimed dramatic actor to C-movie superstar with roles in such abysmal works like Knowing, Drive Angry, and Left Behind. And then we get to Mandy, the follow-up from the elusive director of Beyond the Black Rainbow, Panos Cosmatos. Premiering in the Midnight section at the Sundance Film Festival, Mandy is exactly the sort of thing that the best midnight movies are made of. Cage stars alongside Andrea Riseborough (playing the titular character Mandy) as a woodsman hauling trees somewhere in the Pacific Northwest. The two appear to be husband and wife, and have settled themselves comfortably away from civilization in a remote mountian lodge. One day as Mandy is out for a morning jog, she crosses paths with an eclectic group of self-identified “Jesus Freaks” who then kidnap poor Mandy to be used as some sort of cosmic, ritualistic sacrifice. Mandy is essentially two separate hour-long films; the first half being the more surreal, psychedelic, visually-impressive storytelling that we are familiar with Cosmatos doing so well in Beyond the Black Rainbow. Scene by scene, the pulsating music, visuals, and 80’s aesthetic become so overwhelming that one becomes simultaneously distanced and hypnotized by the dreamstate that unfolds. Characters ramble on and on about cosmic deities and philosophical musings and destiny and the nature of good and evil. Things make absolutely no narrative sense but you don’t really don’t care because Cosmatos believes so intensely in his unique drug-fuelled vision and the vivid details carry the film far above its C-level script. One becomes increasingly less-concerned with why and more transfixed with how things happen as the film progresses. This part of Mandy looks and feels like a painting lifted straight out of a 1992-era Dungeons & Dragons game manual and the scenes are crafted with such Kubrickian-like artistry rarely seen in cinema today. Eventually one part of the story bleeds into the next and the hallucinatory effect of Cosmatos’ cinema-drug starts to wear off as various images emerge and dissipate. A burned body….. cloaked figures chanting in a circle…. and….. is that Nicolas Cage forging a battle axe?!? Suddenly the lucid dream we were experiencing comes to halt and we are snapped into a vicious action story centered around a vodka-infused character (Nicholas Cage) out for blood. Here the film completely embraces Cage’s legacy as the gaudy cult-icon he has become and events go from mildly absurd to full-bore bonkers as Cosmatos turns the Outrageous dial up to 11. 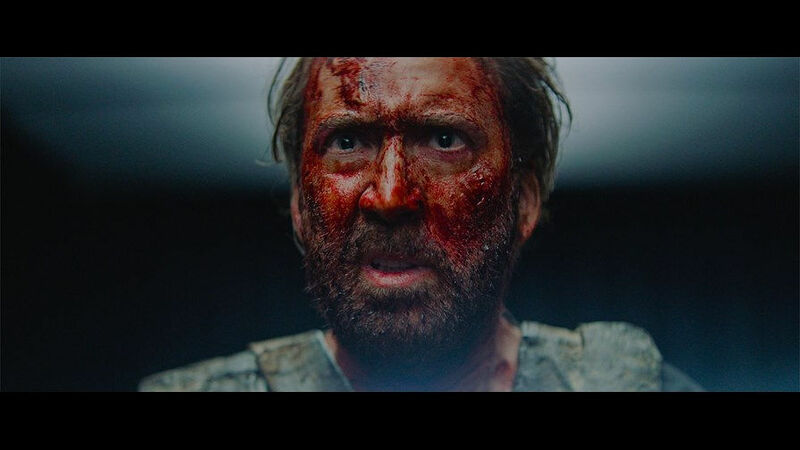 Mandy never enters full on camp territory however, even as Nic Cage breaks the fourth wall to stare directly into the camera and give his signature “You Don’t Say” face (soaked in blood this time, of course); Cosmatos is so committed to his vision that things still feel cemented in a serious story – even when moments become outlandishly bizarre. By the end of Mandy, I found myself mentally and physically exhausted. This film takes you on a journey and steeps its way deep into the subconscious long after viewing. It’s definitely not for everyone, but those inclined toward midnight genre fare are in for a treat. Bottom Line: While some might have a hard time with the film’s slower, more metaphysical first half, Mandy rewards patient viewers with an all-out assault on the senses that culminates into a truly original and exciting viewing experience. Great review. I couldn’t agree more. So many parts of this movie felt like a mixture between an 80s slasher and Heavy Metal. And that soundtrack/film score was simply incredible.